Didy Sopandie Department of Agronomy and Horticulture, Faculty of Agriculture, Bogor Agricultural University (IPB). Plant tolerance mechanism under shade stress is indicated by high chlorophyll-b content, which is synthesized from chlorophyll a by chlorophyll a-oxygenase (CAO) gene. The study was aimed to clone and characterize the partial of CAO gene involved in shade tolerance mechanism in soybean. Total RNA was isolated from the second trifoliate leaves of soybean plants and the first strand cDNA was prepared using Reverse Transcriptase Moloney Murine Leukemia Virus (RT-M-MLV) (RNase H-). Northern blot hybridization was used to analyze expression of partial CAO gene. The result showed that one partial gene, CAO 3-4 (1,052 bp), comprised of 292 adenine (a), 241 cytosine (c), 276 guanine (g) and 242 thymine (t), therefore the number of amino acid deduction was 338. The expression of CAO 3-4 partial gene was higher in shade tolerant genotypes than in shade sensitive genotypes, both under 50% shade and dark. These results demonstrated that the CAO gene is involved in shade tolerance mechanism of soybean. Eggink, L.L., LoBrutto, R., Brune, D.C., Brusslan, J., Yamasato, A., Tanaka, A., and Hoober, J.K. (2004). Synthesis of chlorophyll b: Localization of chlorophyllide a oxygenase and discovery of a stable radical in the catalytic subunit. BMC Plant Biology 4, 1-16. Gopal, K.P., Biswala, A.K., Reddyb, V.S., and Tripathy, B.C. (2005). Light-dependent regulation of chlorophyll b biosynthesis in chlorophyllide a oxygenase overexpressing tobacco plants. Biochemical and Biophysical Research Communications 326, 466–471. Hidema, J., Makino, A., Kurita, Y., Mae, T., and Ohjima, K. (1992). Changes in the level of chlorophyll and light-harvesting chlorophyll a/b protein of PS II in rice leaves agent under different irradiances from full expansion through senescence. Plant Cell Physiology 33, 1209-1214. Hoober, J.K. and Eggink, L.L. (2001). A potential role of chlorophylls and c in assembly of light-harvesting complexes. Federation of European Biochemical Societies 489, 1–3. Khumaida N. (2002). 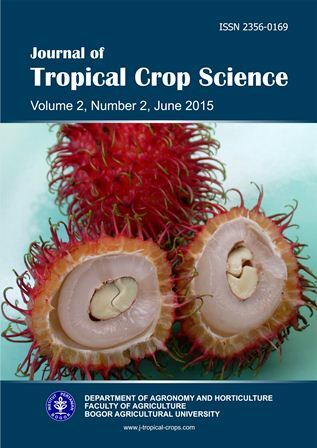 “Studies on adaptability of soybean and upland rice to shade stress”. PhD thesis. The University of Tokyo. Khumaida, N., Sopandie, D., and Takano T. (2007). Glycine max photosystem I subunit PsaD (psaD) mRNA, complete cds. Accession: EF628505. Submitted 21st May, 2007. NCBI. LaRoche, J., Mortain-Bertrand, A., and Falkowski, P.G. (1991). Light intensity-induced changes in cab mRNA and light harvesting complex II apoprotein levels in the unicellular chlorophyte Dunaliella tertiolecta. Plant Physiology 97, 147–153. Lee, J., Kim, J.H., Yoo, E.S., Lee, C.H., Hirochika, H., and An, G. (2005). Differential regulation of chlorophyll a oxygenase genes in rice. Plant Molecular Biology 57, 805–818. Masuda, T.,Tanaka, A., and Melis, A. (2003). Chlorophyll antenna size adjustments by irradiance in Dunaliella salina involve coordinate regulation of chlorophyll a oxygenase (CAO) and Lhcb gene expression. Plant Molecular Biology 51, 757–771. Nagata, N., Satoh, S., Tanaka, R., and Tanaka, A. (2004). Domain structures of chlorophyllide a oxygenase of green plants and Prochlorothrix hollandica in relation to catalytic functions. Planta 218, 1019–1025. Nilsen, E.T., Orcutt, D.M. (1996). “The Physiology of Plant under Stress: Abiotic Factors”. 704 p. John Wiley and Sons, Inc., New York. Oster, U., Tanaka, R., Tanaka, A., and Rudiger, W. (2000). Cloning and functional expression of the gene encoding the key enzyme for chlorophyll b biosynthesis CAO from Arabidopsis thaliana. Plant Journal 21, 305–310. Sato, S., Nakamura, Y., Kaneko, T., Katoh, T., Asamizu, E., and Tabata, S. (2000). Structural analysis of Arabidopsis thaliana chromosome 3. I. Sequence features of the regions of 4,504,864 bp covered by sixty PI and TAC clones. DNA Research 7, 131-137. Sopandie, D., Trikoesoemaningtyas, and Khumaida, N. (2006). “Physiology, Genetic, and Molecular Adaptation of Soybean to Low Light Intensity: The Development of Soybean Varieties as Intercropping Plants”. HPTP Research report III. Directorate General of Higher Education, Jakarta. Tanaka, A., Ito, H., Tanaka, R., Tanaka, N.K., and Yoshida K. (1998). Chlorophyll a oxygenase (CAO) is involved in chlorophyll b formation from chlorophyll a. Proceeding of National Academy of Science USA 95, 12719–12723. Tanaka, R., Koshino, Y., Sawa, S., Ishiguro, S., Okada, K., and Tanaka, A. (2001). Over expression of chlorophyllide a oxygenase (CAO) enlarges the antenna size of photosystem II in Arabidopsis thaliana. Plant Journal 26, 365–373. Webb, M.R., Melis, A. (1995). Chloroplast response in Dunaliella salina to irradiance stress: effect on thylakoid membrane protein assembly and function. Plant Physiology 107, 885–893. Yamasato, A., Nagata, N., Tanaka, R., and Tanaka, A. (2005). The N-terminal domain of chlorophyllide a oxygenase confers protein instability in response to chlorophyll b accumulation in Arabidopsis. The Plant Cell 17, 1585–1597.